Don't chuck out all your UMDs just yet, Sony is considering a program that will offer you downloadable versions of your PSP library. So you've bought one of those fancy new PlayStation Vitas in a desperate bid to stave off the terrifying hollowness that seems to permeate every corner of your being, but what's going to happen to your collection of PSP games? Are they destined to become the paperweights and amusing novelty routers of tomorrow? Not quite yet, apparently. Sony has confirmed that their new handheld will be backwards compatible, with around 500-600 titles from the PSP's library working flawlessly on the new hardware. There's one tiny problem. While the Vita is a testament to technical excess, sporting a fancy OLED screen, two cameras and slightly more touch sensitive part than seems decent, it doesn't have a UMD drive. Panic not! According to Destructoid, Sony is "considering" a plan to provide downloadable replacements for your UMD based games. 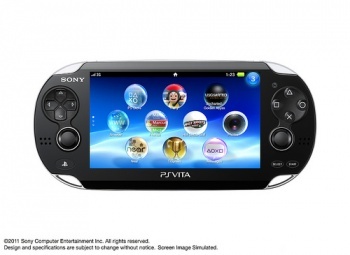 Sony did promise a similar program for their poorly received PSP redesign, the PSP Go, and never came up with the goods, leaving PSP Go owners to hoot angrily and smash UMDs against the screen of their new handheld in a desperate bid to make it run Patapon. Strangely enough, the PSP Go did not sell very well.